A. What to do BEFORE the NFP release? B. What to do AFTER the NFP release? The modelling on related macro-economic data will enable you to elaborate a fundamental analysis to estimate the next NFP release. All the reports we are going to describe take different approaches to determine whether labor-market conditions are improving or deteriorating. At the end of the section you will be geared with a checklist to do your own NFP Prognosis. Most of this data is available on Economic Calendar. Make sure you are familiar with it. Each of the Calendar rows is clickable and this is where the data is to be found. Besides you have a link to the official report below, which in some cases will be needed. NFP stands for Non-Farm Payrolls, which is actually part of the Employment Situation report, released by the US Department of Labor, which also includes the Labor Force Participation Rate, the Unemployment Rate, Average Hourly Earnings and Average Workweek Hours, among many other statistics. The NFP component seems to get the most attention because it measures the actual number of paid employees (full and part time) in the business and government establishments. To be accurate, the Non-Farm Payrolls (NFP) number is the total number of employees in all sectors, farming industries excluded, while the RELEASED figure is the monthly changes to this figure. One should therefore use the expression "changes to the NFP number" more than "the NFP number". It measures the number of jobs created or lost in the U.S. economy over the prior month. For instance -200k means 200k jobs were lost in all non-agricultural business. A look at the history of NFP releases is a good starting point to get a feel for the jobs situation.. Try to detect the long-term trend in the NFP figures, if it is rising of falling. (The chart above, taken in June 2017, shows a weakening trend made of lower highs). Look also at the ranges: were recent reports close to historic highs or lows? Are expectations for the next release far from the last figures or are they too modest? In both cases we might have room for surprises, which we will deal with in the second part of this study. On FXStreet’s calendar, you can find the report showing its data series on a chart. It is released usually on the first Friday of each month, at 8:30 EST. The number is subject to revision for two months, and those reviews also tend to trigger volatility in the Forex board as we will explain further below. This report, released monthly by Challenger, Grey & Christmas, provides information on the number of announced corporate layoffs by industry and region. Because the CGC reflects companies’ future plans, its release tends to be more forward-looking than most economic reports. The data is based on previous corporate announcements but it aggregates upcoming layoffs and hirings. Layoff announcements shouldn’t be utilized as a sole leading indicator of the NFP, but because of its forward-looking quality, it provides useful hints on where the job market is headed. As an NFP expert, you take the numbers and look for a consistent pattern together with the rest of leading indicators. For example, a large and unexpected jump in layoffs, i.e. a high reading, is a bad omen for the job situation and hence for future NFP releases. This is especially true if it happens in a context of economic weakness as expressed in a weak employment component of the ISM manufacturing. Use this number to discount after you estimate your headline number. For example, if your model suggests 300K jobs at NFP, but the average Challenger Report is 50K job cuts, then reduce your estimation to 250K. You can find the report and its historical charts on FXStreet’s calendar. It is usually published the first week after the end of the reference month and it is expressed in number of persons (thousands). There have been very few revisions to previously released data. One of these was in May 2017, which was higher at 51,692 than the 36,602 figure in April and the highest since April of 2016. 20,000 of those job cuts were supposedly announced by Ford Motor Company but later this number was reduced to 1,400. Ford had reached out and informed CGC that the 20,000 number was incorrectly reported several weeks before. As an expert, you might check the original source for the finer readings of the data. The Initial Jobless Claims released by the U.S. Department of Labor is a measure of the number of people filing first-time claims for state unemployment insurance. Continuing Jobless Claims on the other hand, measures the number of individuals who are unemployed and are currently receiving unemployment benefits. 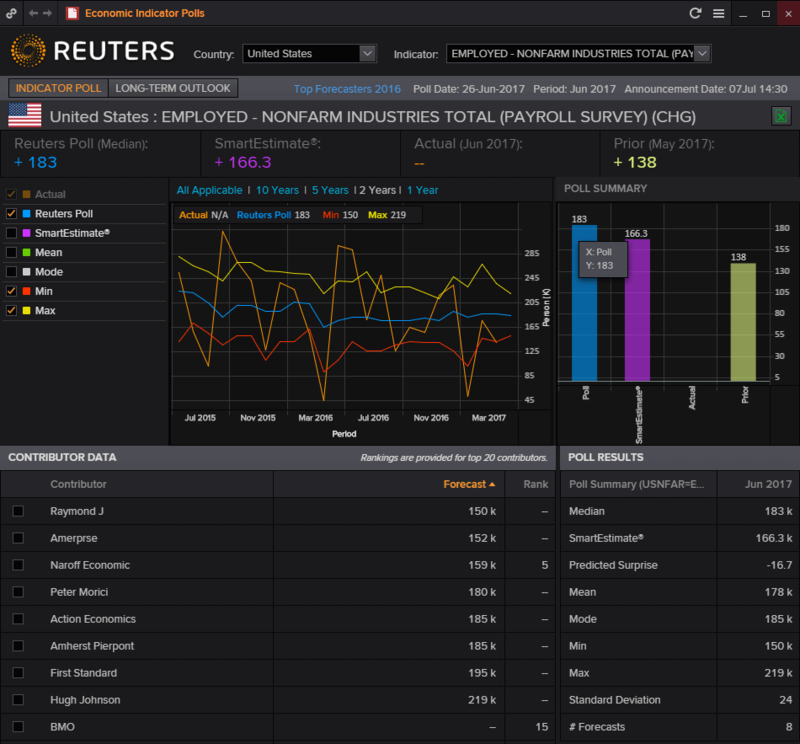 Experts seek out clues in the Initial Jobless Claims report because of its weekly frequency, and because it reflects what is going on in the job sector.. Moreover, it is viewed as a good coincident indicator based on actual reports from state agencies around the U.S. When looking at the Continuing Jobless Claims numbers– the weekly claims for unemployment insurance– is important to know that not everyone who is jobless is entitled to unemployment benefits. If the number of people filing for unemployment benefits increases on a sustained basis or is relatively high, it means a large number of people are losing their jobs and applying for unemployment compensation. In such a case, investors and traders will infer that the economy is ailing and the next NFP release may come out weak. Alternatively, a decline in the Initial Jobless Claims is indicative of a healthy economy and future NFP releases should reflect a more positive mood. With the Continuing Jobless Claims, a rise in this number has negative implications for the NFP, since it will affect consumer spending which in turn discourages economic growth. Generally speaking, a high reading is seen as negative for the labor market while a low reading is seen as positive. They are generally analyzed as a four-week moving average (MA), in order to smooth week-to-week variance. As you see in the below scenario, they can diverge from each other, not making a strong case for the next NFP release. On FXStreet’s calendar, you can find both reports each showing their data series on charts. Minor revisions can be made to the previous month data. 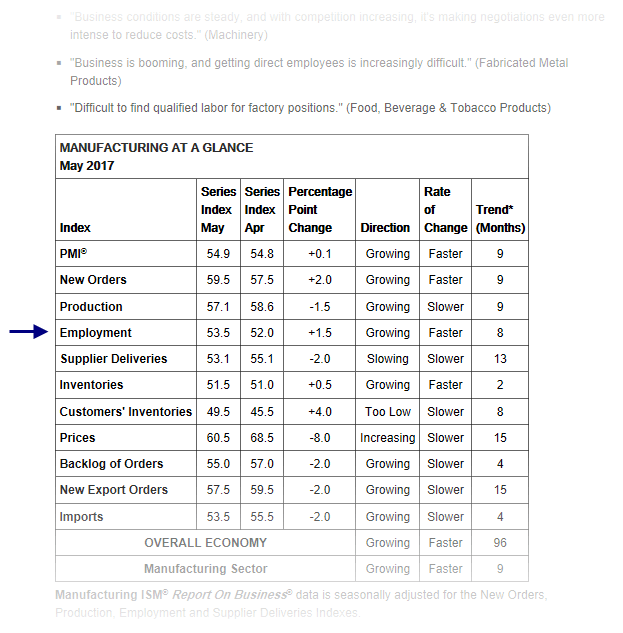 Released by the Institute for Supply Management (ISM) the first business day after the reporting month, these indicators show business conditions in the U.S. non-manufacturing and manufacturing sectors. To compute these business activity indices, survey respondents are asked if they are experiencing higher or lower activity (or no change) for each of the 10 components of the indices, including employment. 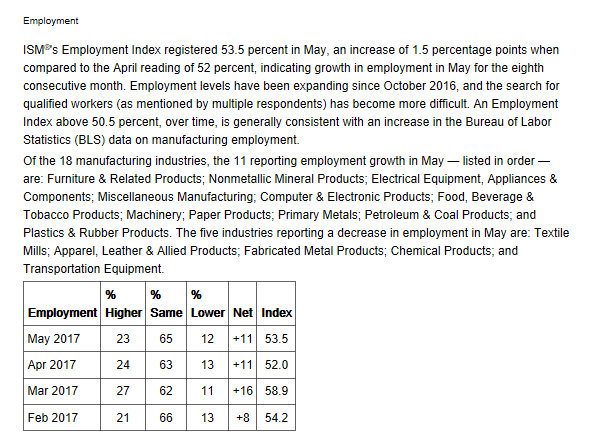 This component tells whether employment is experiencing an increase or decrease and its rate of change. Some analysts suggest that the Manufacturing ISM has a closer relationship with payrolls, as jobs in this sector can be easier to measure. In contrast, it can be hard to measure jobs in the services sector due to the temporary nature of some of these jobs, remote working etc. But you should consider the employment component of Non-Manufacturing more important than the Manufacturing, simply because services sectors amount to 70% of US employees. This information provides a window on business plans and on what the monthly NFP number might reveal when it comes out for the reported month. Make sure you read the employment summary in the official reports to infer about the labor market conditions. Expressed in percentage terms, a higher reading means the majority of respondents’ comments indicate optimism about business conditions and the overall economy, a case for a strong NFP. On FXStreet’s calendar, click on each report’s row, and below the description of the report click on “Read the official report”. It takes you to the original report on the ISM website. Once there, scroll down for the employment data and commentaries further below. There are no revisions, but there are yearly reassessments of seasonal adjustment factors. Released by the University of Michigan in association with Reuters, this index is based on a survey of personal consumer confidence in economic activity. It queries 500 adults. Many experts mention this survey more frequently that the Conference Board’s Consumer Confidence Index (explained below) for an early clue on the NFP. Its popularity among analysts is partially because the data includes interviews conducted up to a day or two before the official release making is a good real-time measure of consumer mood, but foremost because it gauges consumer attitudes on financial and income situations. Consumer exuberance can translate into greater spending and faster economic growth. Therefore, a positive correlation is expected to the NFP numbers. As such, a high reading anticipates a strong NFP, if aligned with all the other indicators. But as with other sentiment tools, this one seems to be a better gauge when identifying the first signs of an exhausted economy than the beginning of a recovery after a depressed cycle. Behavioral finance studies explain this in terms of people being usually more sensitive to losing money than happy about gaining it. So make sure to contextualize the report in the overall business cycle. The above chart shows the Actual data for the past two years and the Consensus line lagging behind almost all the time. For your purposes, hover with the mouse on the “Actual” blue square and extract the information you need: the trend and the most recent release. The index figures are published twice a month consisting of a preliminary release mid-month and a final report at month’s end. Most details are reserved for subscribers. As for viewing historical charts, FXStreet’s calendar offers all you need. The revisions are part of the release structure: the preliminary numbers, out mid-month, are revised two weeks later. In FXStreet’s Economic Calendar each numbers series has it’s own historical chart. The U.S. Consumer Confidence Index (CCI) measures the degree of optimism on the state of the economy that consumers are expressing through their activities of savings and spending. It queries 5,000 adults. The Conference Board questionnaires place more emphasis on household reaction to labor-market conditions than other surveys. But analysts also know that the labor market is slow in reacting to economic changes. In any case, you should add it to your NFP-checklist. A high level of consumer confidence stimulates economic expansion while a low level can lead to economic downturn. The correlation is straight forward: an uptrend is the index is good for NFP prospects while a descending trend (or bad data for that matter) is a bearish omen for the next NFP. Be advised: since the Conference Board queries an entire new group of people every month, the index shows more erratic behavior than the University of Michigan’s which polls many of the same individuals every month. In any case, trends may develop which makes up for a stronger case. The Conference Board is a subscription-based service, and unfortunately the data does not appear on FXStreet’s Economic Calendar anymore. But News pieces are published after the report which can be sought after under the News section of the website using the search topic “ConsumerConfidence”. Automatic Data Processing Inc., a leading provider of payroll-related services in the U.S., in association with Macroeconomic Advisers LLC, releases a monthly employment estimate based on a sampling of real payroll data collected from around the country. Investors often consider the ADP report as the harbinger of the BLS release on payroll jobs, the NFP, because of the existent correlation between the two. The overlaying of both series below should speak for itself. But generally - on individual months - the discrepancy can be substantial. Another reason FX traders follow this report is the same as with the Employment Situation report: a persistent vigorous growth in employment figures increases inflationary pressures and with it the likelihood that the Federal reserve will raise interest rates. A strong report indicates a lot of hiring in the private sector. If more people are working, household income rises and that fosters more consumer spending. Much of the focus FX traders put in this report rests on what impact the estimates will have on U.S. interest rates. A job growth of less than 100,000 a month suggests a weakening economy. Published monthly, two days before the Bureau of Labor Statistics puts out the NFP, the data can be seen on FXStreet’s Economic Calendar. Past months’ data, consensus and actual releases, are shown. There can be minor revisions for the prior month. The report publishes total number of new hires and layoffs in the month, as well as how many job openings remained in that period. It gives a snapshot of the need for employees in different parts of the economy. The JOLTS provide a fuller picture of the churning that occurs in the workforce. By now you already know that the NFP is the month-to-month change in the number of people on corporate and government payrolls, which is simply the net difference between the number of jobs created and the number of jobs eliminated. But that figure doesn’t inform about the actual gross figure of positions filled and eliminated in the labor market. Traders therefore look for this report to get information about the total number of hires, job openings, and level of quits. It t is supposedly one of the jobs reports Fed Chair Janet Yellen pays most attention to. The Job Openings represent the number of jobs available on the last day of each month, made of positions that firms are actively recruiting from outside the company. Firms are highly sensitive to a weaker demand for goods and services and manifest that by pulling back on job postings well in advance of an economic recession. An increase in Job Openings is therefore seen as positive for the next NFP release and vice versa. Hires refers to the total number of positions filled in the same month. The pace of hiring is what traders and analysts look at. A slowing pace is seen as negative and vice versa. A third piece of data is shown, Separations, which includes quits, layoffs and discharges, and other separations. There can be a lot of noise in this series and messages can also become contradictory. To better understand this component, we recommend visiting the original report which usually offers more information on the definition level as well as to corroborate the data with other economic indicators with the help of FXStreet’s dedicated Contributors. Published monthly, about five to six weeks after the reference month by the Bureau of labor Statistics, the Job Openings component can be seen on FXStreet’s Economic Calendar. Past months’ data, consensus and actual releases, are shown. A link to the original report is provided. With each release, minor revisions are made to the previous month. There could be other indicators used as leading such as home sales, construction spending, and auto sales, all of which can provide hints if people are being hired. But we will leave this in your hands to explore further. At this stage you already have your checklist of NFP-leading indicators. First you have to ask if they are unanimous in their outcomes, that is, if the majority of indicators point to a stronger or a weaker NFP reading. Second, you want to know how many of them line up with NFP expectations, the so-called “Consensus” numbers. If expectations do not differ too much from your own estimation, perhaps there is less chance the “Actual” figure will surprise the market and consequently trigger any big USD move. Third, make an assessment if prices are showing the expectations being already discounted. In such a case you could witness a so called “buy-therumor-sell-the-news” effect. Now that you have spotted for consistent patterns among the several leading indicators, you are prepared to take trades before the release. The next block will be about trading the reactions to the Actual release. Now that you know whether the risk of the next NFP release is to the down- or upside, especially if leading indicators are consistent with a weaker or stronger NFP, you need another checklist to interpret the Actual data and some of the sub-components of the Employment Situation report. How to judge the total number of sub-component releases up against each other, is the critical part in terms of trading the outcome and when doing so, there are several additional considerations to be taken into account. One is that during certain times, the changes to the NFP figures are more important than either of the other releases. This is especially the case during periods of high unemployment and the NFP releases is then - by far – the most important release. A big surprise element in this release will therefore have a substantial U.S. Dollar impact. When unemployment is low - and as low as it is today (having in mind that 4% unemployment in the U.S. is by most economists seen to be close to no unemployment at all) - the NFP releases have less influence. Attention is then more towards Average Hourly Earnings (and possibly Average Hourly Week), as this number is important to inflation and therefore an interest rate sensitive number. The first figure that comes to anyone's mind during release time is the changes to the NFP number and the first reaction in the market (over the first seconds) is always a consequence of the surprise element in this figure- the surprise element being the Actual number versus Consensus estimate. A NFP release which is stronger than the consensus estimate indicates that the labor market is stronger than the markets expected, and the U.S. Dollar often rises as a result. Alternatively, if the Actual report veers below the Consensus expectation, the U.S. Dollar often depreciates against other currencies. In any case, you should look for shocks or surprises between both numbers. However, this rule is not absolute, and we need to keep in mind the previous release (one month earlier). Be aware that significant improvements are expected when the previous release has been very weak, and vice versa. The initial reaction can be extended, muted or even corrected, which is a consequence of the few seconds it takes for traders to absorb what the other figures are telling - and whether they are supporting or contradicting what the NFP release said. It takes a few seconds to absorb and digest the overall impact from the NFP release, revisions of earlier NFP releases, the unemployment rate, the participation rate and average hourly earnings (possibly also average working hours) - and it is first then that you get impact, which is a better indication to what the overall impact will be over the 30-90 minutes to come. How to judge the total number of sub-component releases up against each other, is the critical part in terms of trading the outcome and when doing so, there are several additional considerations to be taken into account as we shall see in this Part B of the study. What would be considered a surprise? 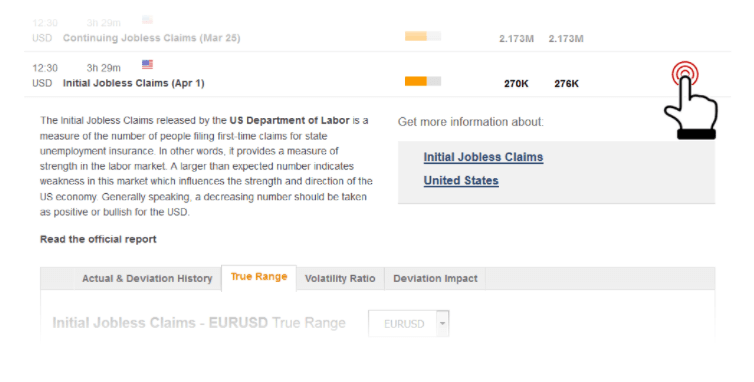 FXStreet has come up with an handy tool to give you an objective answer to that question. The deviation (variance) information is published at the same time the data is released (as this is being written, summer 2017, it is not pushed through though, you have to refresh the calendar). This proprietary indicator shows the ratio between the difference of consensus and actual numbers, and the standard deviation of this difference for the previous 5 events. Should several consecutive “surprises” occur, each new one will show a lower deviation number: the market will be already used to surprises and have them discounted in the prices. Typically a number above +3 (or below -3) would be considered a market moving deviation.. Besides of the deviation calculation, we publish tons of material dedicated to the NFP release which will help you gauge what would be considered a surprise. An NFP-editorial page is to be found under the Economic Calendar section. In case of a deviation, will it be sufficient to move the USD? This is a more tricky question that we have tried to answer with another market-impact study. Switch the tab by clicking on “True Range” and the chart will show how much each release moved each of the 5 pairs available. The True Range chart shows the volatility of a currency pair in terms of pip variation 15 minutes and 4 hours after the data release. The amount of pips is indicative of the potential the release has to move the markets again in the future. The declining average of the True Range shows that the NFP report, while still being one of the most important economic indicators, has been losing force as a market moving event. In addition to the surprise element, one also has to pay attention to the actual NFP number and especially whether the number is above what is generally seen as the number that causes US employment to increase. In order to count for random fluctuation in the data, averaging over 3 to 4 months, or calculating the year's average as a benchmark level, might be the good procedure. Our economic calendar goes back a couple years in the data, but you have to do the averaging yourself. In order to look further back, we encourage you to click on the original report (you can do this from within the calendar itself) and check the BLS website for longer history data. An above average headline release may indicate an increased velocity in the current uptrend or perhaps a potential change in trend in a down trend. This number is somewhere in the range of 150-200K. What it means is that there are so many people leaving the US labour market (for various reasons) every month that you need the NFP release to be somewhere in the range of 150-200K to actually add to US employment. In many ways, a positive NFP number is not necessarily expressing a healthy employment situation in the US, unless it exceeds the number of people that for various reasons are leaving the labour market. 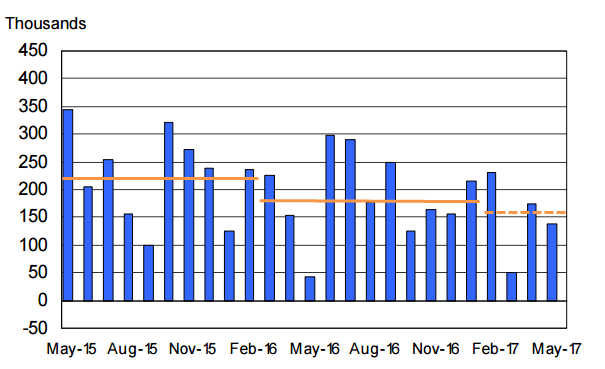 The orange lines are the yearly averages we have drawn on the original chart. You can see this step wise decline in the NFP data. Since NFP's 1st release in February 1939, the overall job averages generally tend to run in increments of 50,000 ranges from month to month and decade to decade. This 50,000 range is vital to understand the overall 50,000 month to month ranges as it remains fairly consistent for the 78 year period. In the last 3 years or 36 months, for instance, 18 months (half of the period) had 50,000 job ranges and 23 months had less than 100,000. In uncertain times such as the 2008 - 2009 crash period, the NFP went out of the 50,000 range. The 2001 terrorist attacks also went out of the 50,000 range. The Paris Accords, Louvre Accords and Smithsonian Agreements in the 1980's as well as the early 1981 recession saw the 50,000 range out of kilter. But generally, 50,000 seems to be the perfect average to assess NFP's and to trade the outcome. Note that Continuing Claims also has a 50,000 range which puts this release as the most important to assess a higher or lower NFP for Friday. You can run the numbers on the BLS site. 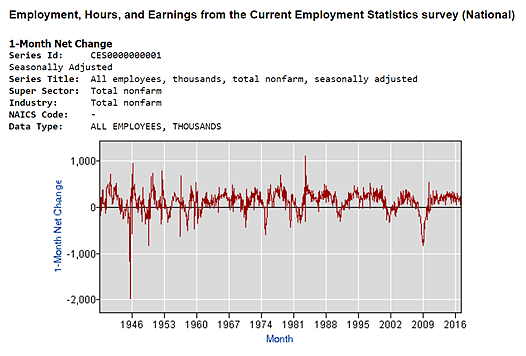 First you go to www.bls.gov/ces/ and on the top right corner “Change in Total Non Farm Payroll Employment”. Click the chart and in the From Box insert 1939 and click the blue “Go” button. The 78-year chart will appear and the full data. To Trade NFP's take the forecast then add and subtract 50,000. If the release is higher than 50,000 then the release is out of range and EUR/USD drops below its normal range. If, on the other hand, NFP is below 50,000 then it's out of range and the EUR/USD goes higher to break its ranges. Within 50,000 then all currency pairs just range in small increments. Trading not only the actual release against the expectations, but also against the previous figure, can be a way to go. When the NFP comes out higher than the estimate and also higher that the previous NFP number, the Dollar will likely move higher, and vice versa. If the NFP shows a higher gain in the actual reading compared to the previous reading, but fell short of the expectations, the Dollar could still rise based on the improved labor numbers, despite falling short of the estimate. Pay close attention the revised number because it can also be considered a trigger of market movement. It is common to see 30% revisions. The market often trades that new information instead of the actual number specially if the current month did not deviate from the consensus data. What to do when successive revisions happen? Well, it’s worth taking them into account when calculating the number of jobs created in a larger period of time. This can make a difference when calculating the average (as we suggested before), or calculating a total sum based on the previously reported numbers without the revisions. The revised numbers are marked with a special icon on FXStreet’s calendar at the moment the data is published. You will find the unemployment numbers often mentioned by analysts. Its forward looking merit resides in its ability to act as an early sign of economic downturn: as soon as executives detect signs of a softening in business activity, they respond fast with layoffs, sometimes months before the economy begins to sink. But there are some caveats with this number. The Employment Situation report is divided in two main parts: the “Household Survey”, which produces the unemployment rate, and the “Establishment Survey” (also called “Payroll Survey”) which generates the payroll numbers shown on most economic calendars. As the name suggests, the establishment survey is based on employer reporting. The household survey, on the other hand, is a phone survey conducted by the BLS. It measures unemployment and many other factors. Let’s say, if you work one hour, even selling trinkets on eBay, you are employed for the purpose of this survey and for the calculation of the unemployment rate.. The same is true if you work three part-time jobs, 12 hours each, the BLS considers you a full-time employee. If you don’t have a job and have failed to look for one in the prior month, you are not considered unemployed, rather, you are considered to have dropped out of the labor force. You need an actual interview or to have sent out a resume to count as “looking for a job”. Besides, in the payroll survey, three part-time jobs count as three jobs. These distortions artificially lower the unemployment rate, artificially boost full-time employment, and artificially increase the payroll jobs report every month because of the potential for double-counting jobs in the payroll survey. To get a more realistic picture of what the unemployment rate is, you have to count all the people who want a job but gave up, all the people with part-time jobs that want a full-time job, all the people who dropped off the unemployment rolls because their unemployment benefits ran out, etc. The BLS calculates this number. You can find it in the last row labeled U-6 and is often referred to as the underemployment rate. It is usually much higher than the more commonly quoted U-3 unemployment rate. In fact, both numbers would be higher still, were it not for millions dropping out of the labor force over the past few years. Some of those are absent because they have retired. The rest are due to forced retirement, discouraged workers, and young people moving back home because they cannot find a job. Non-farm payrolls have been growing consistently in a range of 100k-300k in the past few years, with lower unemployment rate. The participation rate, also released by the BLS, is the percentage of the total number of people of labor-force age that is in the labor force (either working or looking for a job). A decline in Labor Participation is seen as negative because it means less people are looking for a job. When the Unemployment Rate (U= unemployed / LaborForce) drops because of a reduction in Labor Force, is not a good economic signal either. The good signal is when the unemployment rate drops and Labor Force Participation rises. The Unemployment Rate may also tick lower driven by a retreat in the Labor Force Participation rate. In other words, the decline in unemployment can be caused by fewer U.S. citizens looking for work rather than a big gain in U.S. citizens with jobs. So a drop in unemployment can partly be attributed to a decline in the Labor Force Participation Rate. In a recessionary environment, for instance, a sudden drop in the Participation Rate is critically assessed because workers may get discouraged after trying to secure employment for a long time, and they may decide to drop out of the workforce. This would make the Participation Rate fall, as these people are then classified as not actively seeking employment. The data can be seen on FXStreet's Economic Calendar. Past months' data, consensus and actual releases, are shown as a separate report from changes in Nonfarm Payrolls. We have been showing you there are some nuggets of information in the official NFP release which can provide useful insights for the whole set of labor-market-related data. Average Hourly Earning, also released by the U.S. Department of Labor, is a significant indicator of labor cost inflation and of the tightness of labor markets. Included in the NFP report, it estimates the average (weekly) earnings of all non-farm employees. The data in the report typically accounts for about 80% of all U.S. employees, whose labor produces the GDP (Gross Domestic Product) of the U.S. The interpretation is straight forward: If worker incomes rise, it bodes well for future spending, since wages and salaries from employment make up the main source of household income. The Federal Reserve Board pays close attention to this data when setting interest rates, because of its strong correlation to inflation. People won’t spend if they don’t make enough to do so. Poor wages are a drag on inflation, strong wages are the opposite a sign that inflation may start to growth. For this reason, wages within the report have been gaining more weight month after month. The data can be seen on FXStreet’s Economic Calendar. 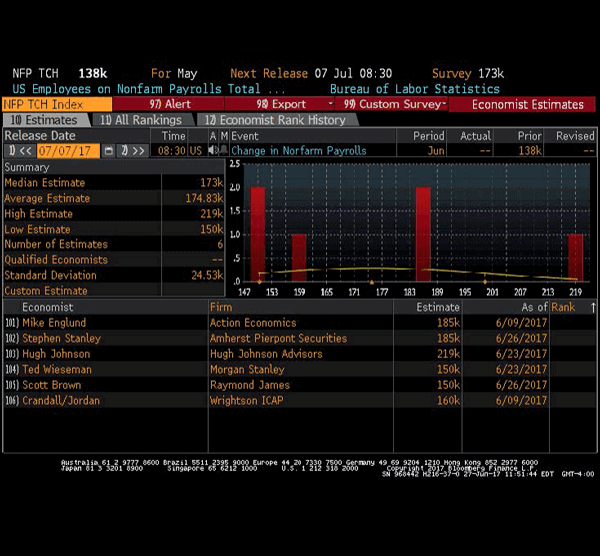 Past months’ data, consensus and actual releases, are shown as a separate report from the NFP. There can be revisions to the data which often go back two months. The Average Weekly Hours is a compilation of the average number of hours worked per week (including overtime) by all employees of private business concerns (except those in the agricultural sector). Overtime hours are an excellent indicators of future employment trends. When overtime increases are sustained for several months, companies will be pressured to hire new employees. Therefore this report can be seen as a precursor of new permanent hiring, or an early indication that employers are preparing to boost their payrolls, although in the later stages of economic expansion,is may be seen as a sign that employers are finding it hard to get qualified applicants for open positions. The reason these indicators is used it as a basis for analyzing other employment statistics is the fact that in the US, unlike in many other countries, the workweek is not fixed. Employees can work any number of hours per week (including overtime). It's also worth knowing that unpaid absenteeism, labor turnover, part-time work, and stoppages cause average weekly hours to be lower than scheduled hours of work for an establishment. This data is of minor importance and few analysts do mention them. In order to calculate the Consensus numbers for the NFP (or many other reports for that matter), analysts are surveyed about their forecasts for that particular release. It is only accessible with an access to a Reuters or Bloomberg terminal. A lot of dispersion means poll participants have no clear estimates based on their models and– similar to FXStreet’s FXPoll released each Friday, the higher the number of participants the better. One thing you will need to know when preparing to trade the Employment Situation report is the difficulties there are to trade the NFP release through broker platforms. We constantly hear about prices not being accessible (flashing yellow prices more than green and red) for seconds after the release. This is simply due to the lack of interest liquidity providers have to supply broker platforms with prices during the heated seconds after the release. Liquidity providers give priority to their own volume clients and could not care less about retail traders over these critical seconds. Retail traders are therefore often left with a gap move from the release price before they can enter a trade. Possibly also a stop done way away from the level set, should they have such orders in the system. Instead of trying to hit prices over the first seconds and experience the difficulties in obtaining tradeable prices, one way could be to cover your interest in the form of pre-set orders. There is an additional risk element of doing so but it is also a higher probability of having executions done. The divergence between “target” spreads listed by brokers and the actual spreads applied during a high volatility event as the Non-Farm Payroll can be substantial. During these minutes spreads first fall apart and recover slowly afterwards as market calms down. Usually spreads get wider right before the economic event, they sky-rocket right after the announcement and then they consolidate after a couple of minutes at a slightly higher level. How particular brokers handle economic events is something you should verify. Even if you get a competitive quote from your broker it doesn't mean you will get a competitive fill price. Slippage due to low liquidity and/or latency is frequent especially around such events. Most forex brokers now use Non-Dealing Desk and ECN business models. They are not market makers. This means you receive the retail market price for your trades. During high volatility situations the market is either very thin or has a glut of orders that needs to be processed. In either case, the BID/ASK spread can widen, sometimes as dramatically as 25 pips. Its not your broker's fault... that is the market price at that moment. If you had placed your stop 20 pips away, you would have been stopped out of an otherwise potentially profitable trade. The battle for positioning heading into the figure can cause skewed trading conditions even in the days leading up to the release. Participants looking to establish positions pre-release can cause unexpected directional flows in a currency pair. For example, if markets are expecting a strong number we could see people trying to sell EUR/USD ahead of the release expecting USD to strengthen against EUR causing EUR/USD to go lower. The volume of this positioning is key. If we see large institutional players positioning then this tends to have a bigger effect on the currency pair than if we are seeing smaller speculative players positioning. The actual size of the positioning itself is also important, if Institutional players are positioning with reduced size it will have less of an impact than if we see them positioning with greater size. For all these reasons, whipsaws, wide spreads and slippage, it is not advisable to use an options style trading strategy by placing market orders above and below the current price just before the release of the Employment Situation report. It is generally done with a One-Cancels-Other (OCO) so that if one order is triggered, then your position is entered into the market and the other order is canceled. The goal of this strategy is to get into the trade immediately after the news and in the direction of the initial move of the market. But the mentioned potential dangers make his strategy a risky proposition.